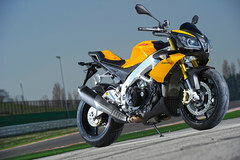 Aprilia Tuono V4 R APRC - a superbike with high handlebars. The Tuono V4 R naked machine is one of its kind with a V4 engine. The naked bike is now available with APRC package.